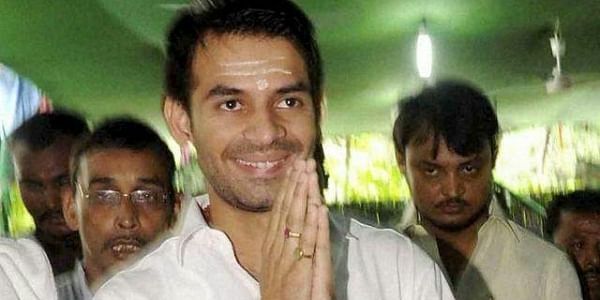 Bihar Urban Development Minister Suresh Sharma on Monday called former state deputy, Tej Pratap Yadav mentally unstable. PATNA: Bihar Urban Development Minister Suresh Sharma on Monday called former state deputy, Tej Pratap Yadav mentally unstable. Sharma’s scathing attack comes hours after Tej Pratap said he will get Prime Minister Modi ‘skinned’ if any harm is done to his father Lalu Prasad Yadav. While speaking to ANI, Sharma said “Only a person who is mentally unstable will make such statements, a politically sane person will never make such statements”. “Lalu Ji also said things in the past but never crossed lines like this,” he said. Earlier in the day, Bihar Deputy Chief Minister Sushil Modi also said Tej Pratap Yadav would be taught a lesson by the public for his threat to Prime Minister Narendra Modi. Tej Pratap's remark came in the wake of the Centre's decision to completely withdraw the NSG (National Security Guard) security cover provided to Lalu Yadav. His Z-Plus security category has also been downgraded to 'Z' category. "Despite that (security downgrade), our programmes are continuing and Lalu Yadav is addressing rallies. However, this is a conspiracy to get him (Lalu) murdered, but we will give a befitting reply to them (the Centre). We will get Narendra Modi skinned (Hum Narendra Modi ki khaal udedhva denge); go and tell him," Tej Pratap said. Sushil Modi further said that Lalu Prasad shouldn't be scared of anyone as people were more scared of him. "Who is Laluji scared of? Why does he need the security? This was a status symbol for him. But now the entire Bihar is scared of him and his foul play," he said. The centre reportedly thinned down the security of the Rashtriya Janata Dal (RJD) leader after the home ministry reviewed the security of the VIPs. However, more than 30 personnel of Central Reserve Police Force (CRPF) will still provide a shield to the RJD supremo.